Unemployment in Minnesota is a unique area of the law. 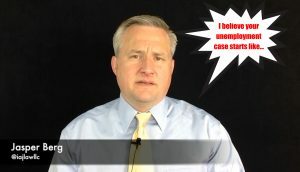 As an unemployment lawyer, the idea behind these blog postings is to inspire a conversation with applicants seeking help. MN claims for benefits include a variety of topics and concerns. This includes denied claims, appeals and employment misconduct. Also, topics include evidence, Minnesota laws and statutes, judges, subpoenas, and reconsiderations. Additionally, applicants and unemployed workers can find feedback on overpayments, garnishments, unemployment fraud and giving testimony at a hearing. Whether the issue is about a discharge, witness selection, getting fired, winning a claim, obtaining employment records, etc., you will find a variety of articles. Appeals for benefits can come in all shapes and sizes. Whether an employee is seeking their first phone appeal or an appeal to the Court of Appeals, termination events are specific to each individual. You will find postings about MN statute 268.095, making objections, health issues and suitable work claims. Also, you will find discussions about revenue recapture matters, eligibility concerns, quitting a job, and repayments. I am very grateful to those offering comments and sharing these posts with other people. Otherwise, if you or a family member needs help with an issue in Minnesota, please contact this law office for one-on-one attention.